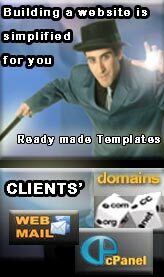 Domain is the name of your website. If you have a name in your mind for your proposed website and you want to check whether it is available or taken already - here is the link to check its availablity. The charge for non-profit organisations is minimum (Pack I, Rs.2,500/-) and the for industries and companies various packages (even tailer-made packs) are available. Linux/Windows/Java Hostings. Pack II = Rs.6,000/-, Pack III = Rs. 10,000/-, Pack IV = Rs. 20,000/- so on . . .
To receive more benefits from websites, the site should be optimised for popular search engines'. Experts like us will bring high site ranking to the website, which reflects in more number of visitors. It is our pleasure to welcome you here. This site is part Sanath Tech Solutions Pvt Ltd company, created for web-hosting and related businesses. Our web-customers can find the easy access resources from the appropriate pages of this site. Copyright © 2009-10, Sanath Tech Solutions Pvt Ltd, All rights reserved.